SKU: Brown 'FEED ME CHOCOLATE' Lanyard. Category: Black VOLUNTEER Lanyards. This lanyard is a professional and convenient way of wearing your identity badge. It is a strong black material strap, which is soft to wear against your neck & is pre-printed with the word ‘VOLUNTEER’ on both sides. The black plastic dog clip attaches the strap securely to the card holder. These lanyards feature a safety breakaway device. If the strap is pulled sharply it will come away, avoiding the previous dangers associated with neck chains or straps. This does not damage the lanyard and it can easily be reattached afterwards. Larger quantities are available from our positivID ebay shop. Don’t forget to shop for card holders & accessories! We stock single sided, double sided, flexible and rigid card holders in our eBay shop. We have a fantastic selection available in a variety of colours! 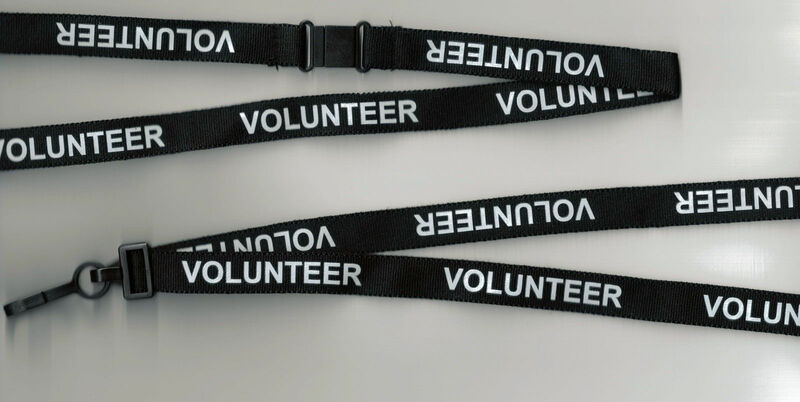 Why not check out our full range of pre-printed VOLUNTEER accessories and lanyards? Just click on the ebay shop logo below! International buyers please contact me for competitive postage rates. Please see our about me page for further company details. Copyright © 2016 Positive ID. All Rights Reserved. Website by Create Designs.